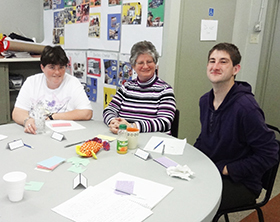 The Leaders Within Program, originally funded by an Ontario Trillium Foundation grant in 2013, is an exciting opportunity for people who have an intellectual disability to learn the skills and develop the confidence to engage in public speaking events. The development of self advocacy is a natural progression. The leader curriculum utilizes a “train the trainer” model where current trainers prepare employees to be leaders. This ensures the program is sustainable with limited financial resources. The participant curriculum is developed to help participants understand their skills and abilities and then apply them through public speaking. By building the participant’s public speaking and leadership skills, graduates gain self-confidence and self-esteem and develop the ability to speak up and exert their wants and rights as active members of society. Graduates of the Leaders Within program speak at various events related to Community Living Chatham-Kent and are available to speak at service club meetings, and local businesses. To learn more about the Leaders Within program or to reserve a speaking opportunity, please contact info@clc-k.ca.